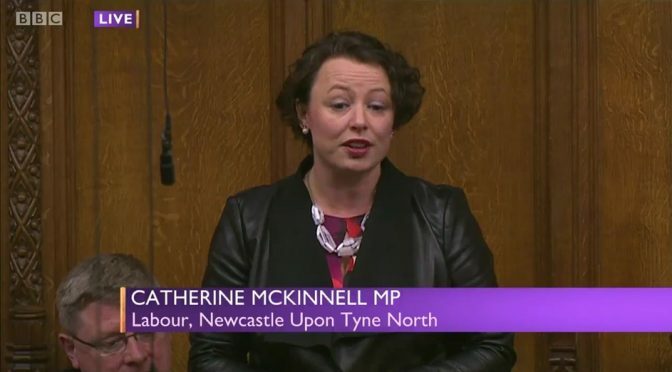 Newcastle North MP, Catherine McKinnell, has today challenged the Prime Minister on the future of almost 1,500 apprentices employed by Carillion, which went into liquidation this week. Catherine has previously visited Carillion’s Gateshead training site, in her capacity as co-chair of the All-Party Parliamentary Group (APPG) on Apprenticeships, meeting with several local construction skills apprentices to hear more about their work. Carillion had eleven apprenticeship training sites around the country, and was the UK’s largest private sector employer of construction apprentices. Its Gateshead training centre offered apprenticeships in a number of areas, including bricklaying, carpentry, plastering, and painting and decorating. ‘The Government must take responsibility for its role in the mess now left by Carillion. Thousands of staff face unemployment; SME suppliers face going bust. ‘But I’m concerned for the 1,400 Carillion apprentices – some of whom I’ve met locally. ‘The Prime Minister’s response – that the Government is ‘aware’ of this issue – will have provided no reassurance whatsoever to the large number of, mostly young, Carillion apprentices who still don’t know whether they’ll be able to finish their placements or even get paid. I am the Labour Member of Parliament for Newcastle North. I hope you find this site useful - and please don't hesitate to get in touch if there's anything you'd like to raise with me. Follow on Twitter and Facebook.